Miranda Colton, presumed dead, finds herself under the care of a native Alaskan and a studious botanist from England, Teddy Davenport. Miranda only longs to find her friends and continue north. She fears that her chances are diminishing with each passing day. Teddy is deeply committed to his research of the unique landscape of the rugged Alaskan frontier. But despite his intentions, Miranda's presence awakens a deep tenderness in his character. As a friendship with Teddy blossoms, Miranda struggles inwardly with her earlier dreams. Then the menacing force from the past threatens to destroy everything she holds dear. What made the experience of listening to Rivers of Gold the most enjoyable? The story was interesting and entertaining. I enjoy listening and she did a great job reading it to me. Good character voices. I enjoyed experiencing Alaska and the gold rush reality. I like happy endings! This life has enough reality and heartache - these trials had a wonderful conclusion. excellent ending to a wonderful series. Wonderful narration. This entire series is worth a listen. Start with book 1 , to get the full story. I misses the first book struggled to read the second book but I very much enjoyed the narrative on the third book in the series. It made me feel like I was right there. ... Christian writer. This story has caused me to examine my faith and the relationships I have with those around me. This third and final book (I wish there were more) brings all the main players to the end of their time in the Yukon. Ms. Peterson still provides surprises and twists. The narrator is good differentiating the voices on the most part, and is excellent at providing elements of emotion; surprise, fear, anger, etc.. Sometimes there wasn't enough of a pause for a scene change, as a result, the story seemed too rushed and this led to confusion. I enjoyed the variety of characters and their in-depth development, but switching scenes and characters too quickly takes away from story development and plot effectiveness. I'm a huge fan of Ms Peterson's Christian stories. She is a true witness of the Gospel of our Lord Jesus Christ; that whoever believes in Him will not perish, but have life ever-lasting. 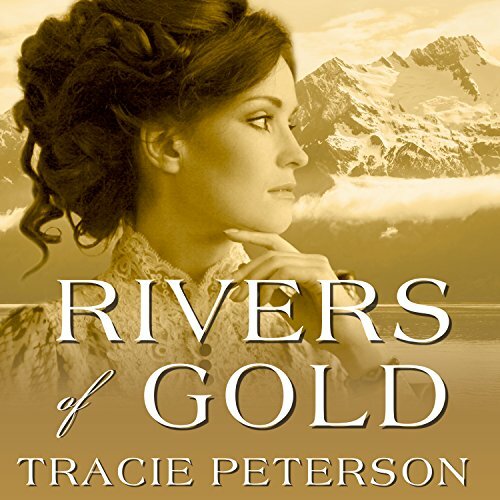 Historical and faith filled story of Alaskan gold rush, Rivers of Gold is the third and final book in the Yukon Quest series . . . no loose ends are left, making me very satisfied . . . as I've become very vested in the lives of Grace, Peter, Karen, Adrik, Leah, Jacob, Miranda and her parents . . . and in this book, Teddy . . . the growth and changes as each comes to the understand and accept the purpose that God has for them are both difficult and rewarding to listen to . . . as it is in our own lives . . . the birth of little Andy and other surprises bring so much joy . . . the ruggedness and harsh beauty of the Alaskan wilderness and of the native people there are depicted as they must have been in 1899-1900, the beginning of the new century . . . I will be listening to more of Tracie Peterson's books . . . Bravo! This series by Tracie Peterson is one of complete captivation! The story keeps you wanting to continue reading without a break until the end. Tracie is one of my favorite authors, I can't wait for a new series. This is one of those time I often experience when I come to the end of a book or series of books thatihaveloved. it's a sadness, I feel like I will miss the characters of the story and wish it could continue on. I really enjoyed this book! The characters are so real I hope this series of books goes on for a long time. I was excited to listen to this book, but the story and performance were both found lacking. There was so much preaching and the same storylines from previous book drug on, with whining women and children. Very disappointing and predictable. Miranda and Grace"s voices sounded the same. It seems the book would have been better in print, as I could have more easily skipped over the long sermons and dramatic prayers. I love Tracie Peterson but this was not her best book. The first and second book in the series were good but this one left me wishing it would just end.